I was not adverse to buying a nice lightweight tent, I just couldn’t afford the ones I wanted. All I wanted was a small lightweight tent, something around 1kg. Less material should mean less money, but we all know that’s not how things work; less is often so much more! So whilst I wouldn’t be able to come up with something of professional quality, making it myself would keep it within my tiny budget and I also had a few ideas about saving excess weight, it all made perfect sense at the time. This is the story of the homemade tent, to act as a warning to many and inspiration to the brave – 900 miles with a homemade tent. I bought some cheap silicone coated Ripstop-Polyester and mesh fabric off the internet, along with a few other bits of hardware, and I used a toy sewing machine to very basically stitch the thing together. I’d sketched out the basic sizes of the panels using a CAD program and applied the dimensions to the fabric using a pencil and straight edge whilst the fabric was taped down to the kitchen floor. Tent poles were carbon from a model shop, and the stops on them were wooden beads just jammed on. The webbing was just cut from an old bag and tent pegs and guy lines were real camping ones. I’d decided on a simple, single skin design. With large vents at each end to try and clear condensation and using the bicycle frame as the main support for the tent. The two smaller poles keeping the foot end of the tent up, and the guy lines keeping the bike and tent upright. 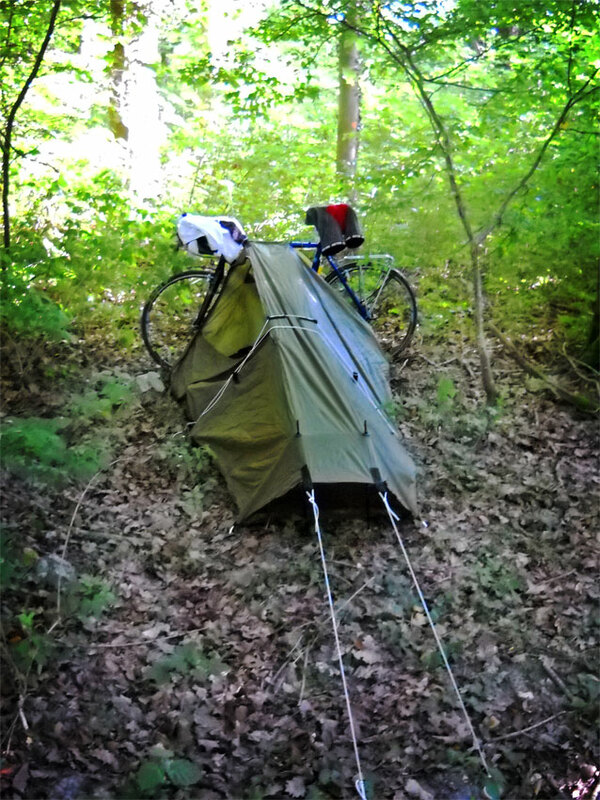 The design had two great advantages, security and weight: Nobody will be able to steal my bike if the bike is part of my tent, and I will not have to carry lots of additional poles to support the tent making the whole package lighter. Win win! The tent was ready, but my plans had to change. The person joining me on the LEJOG trip flatly refused to stay in anything other than hotels, and made it very clear that any extra luggage weight would not be carried by him. The homemade tent was put away, but the dream was still alive. The next year (after completing the Lands End – John O’groats trip using hotels etc.) I was still dreaming of the freedom I’d get travelling by bike. Cycling until sunset and pitching my tent in a secluded spot. I had the tent, I had the bike, and Venice – Italy seemed like worthy destination. I would travel alone from Dover with my homemade tent as my shelter. So after a quick test (cycling out to wild camp in the Peak District National Park after work one evening), I was confident it would work. What’s the worst that could happen? So as it turns out the tent wasn’t entirely waterproof – the flap covering the zip didn’t sit in the correct place, so torrential storms (as experienced in Interlaken Switzerland) would see water leaking straight through the zip above me and onto me. Not pouring in, but a very frequent drip throughout the night. It also wasn’t entirely insect proof – as I discovered the poorly fitting zip (the fault of my poor sewing abilities) would leave a gap big enough for a trail of ants to invade looking for sugary treats right next to my sleeping face, as experienced at Lake Como in Italy. The vents were not big enough – I was cycling in mid-July in over 36°C. Crawling into a dark green tent and zipping it up would have been too hot for most tents; but for one without a large mesh door it was an oven in the sun and heat. I needed a breeze so I would have to lie outside or with the door open all evening until the sun went down. It had to find the right balance between sweating and feeding the mosquitos every evening. Condensation was a problem when wind was low – With the vents at each end it was essentially a tunnel, so if the wind direction was not aligned with the vents they would not work. More, bigger or better placed vents would help clear this. Dual skin tents allow the condensation to form on the outer layer, with the inner layer offering more protection. A single skin tent just leaves the condensation exposed and dripping onto you. So what did I get right? Nobody stole my bike, so the security aspect of the design worked. It weighed 1.1kg including pegs, and I mean proper tent pegs, not some 1g titanium toothpicks. So it achieved the lightweight objective. 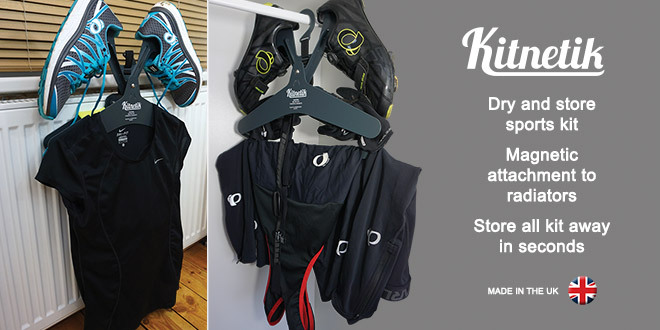 Since I was crossing the Swiss alps over Haute Category climbs I thought lightweight kit was pretty important. Was it cheap? Materials wise, yeah it wasn’t too bad, about the price of a night in a French B&B, and I used it most nights on the trip. Time wise it took longer than I expected to make it, mainly due to the toy sewing machine needing rethreading all the time (it wasn’t very good). It was spacious – The inside had plenty of room. I sat out the storm in Interlaken reading books and writing in my journal. Slightly damp because of the drip, but otherwise comfortable. I was able to sit up at one end and store my bags around me whilst I slept. I survived – So it did work. Nothing failed, tore or broke. It just wasn’t quite as comfortable as a “proper” tent, though that is largely down to my poor sewing ability. I did sleep in a hostel to dry it out after the storm, and a couple of hotels along the way, but I camped for most of the trip. I even wild camped in a woodland. Did you use it again? The next trip I had in mind was Scotland’s outer Hebrides. Wet and windy would definitely feature on a trip like that, so I needed to buy one of those “proper” tents to make sure that dripping water in the middle of the night didn’t make me too uncomfortable . The homemade tent adventure, whilst not a complete disaster, I’ve never slept in it since. I bought a Terra Nova Laser on special offer and have loved it ever since. My point is that if you want something enough you can make it happen. If you want a cycling adventure do it! Use any bike, with any kit you can beg, borrow, make or make do with (stealing is immoral). You may just have the time of your life, I did. 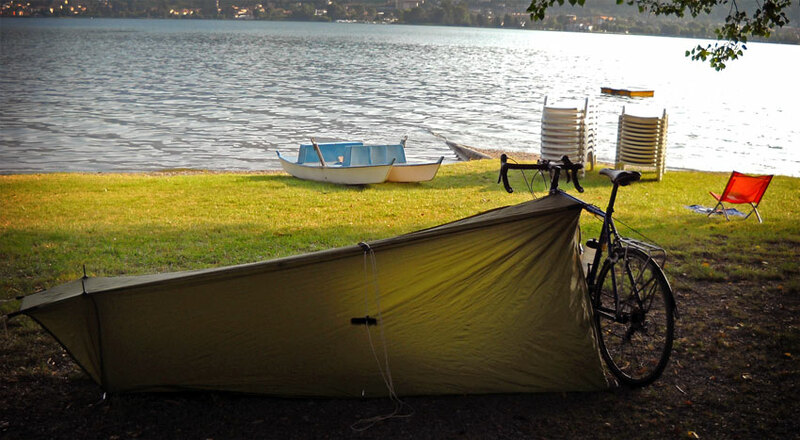 The idea of using the bike as part of the tent structure is genius. You sir, should be on kickstarter! Out of interest, what’s the cheapest lightweight tent on the market? I’m always interested in tent based cycling adventure but like you, I’m put off by weight versus price. The ones I was interested in were around £300, but can be found cheaper (think I found the Terra Nova Laser 1 for £200 in the end). If you will use it a lot it’s a great investment. If you’ll only use it twice then you may as well stay in a 5 star hotel for those 2 nights! Braver than me. I’m looking to do the Race across Iowa for my 50th and roughing it in a high school gym would be the roughest I’d do. Sounds like a great event, good luck!